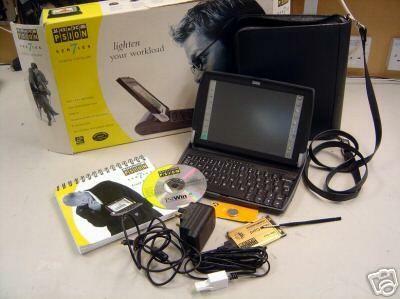 The Psion Series 7 as featured in PC Plus magazine, November 2005. The Good News: The Psion Series 7 appeared in this month’s PC Plus magazine. It’s the PDA that you can’t fit in your pocket. With a reasonably-sized keyboard and colour screen, the Series 7 PDA promised to take computing to places that a full notebook couldn’t reach. It was Psion’s swansong before it transformed into Symbian to concentrate on operating systems for mobile phones. After pioneering the UK personal organiser market, the company had started to feel the pressure, first from Palm and then Microsoft’s Windows CE. The corporate netBook version found some interest with vertical applications, but for most consumers the lack of Windows compatibility ruled the Series 7 out as an option. So just as Psion had done in its previous life as a Sinclair Spectrum games developer, the company did the honourable thing when the going got tough and left the market. Well, all that said and done, it’s still a technical hit here at Potting Shed HQ, as far as I’m concerned. On the left the Prima Official Star Wars Battlefront II Game Guide, on the right Simple Solution Cat Stain and Odor Remover. After I took five boxes of rubbish to the recycling centre at our local Tesco, I popped next door to Pets at Home and PC World for a couple of essentials. In both places I was asked questions the answers to which appeared obvious to me. I handed over a bottle of Simple Solution Cat Stain and Odor Remover to the woman at the cash desk. Me: This is great stuff! She’s now got me wondering, what other things can I use it for? Does she have recipes? The only reason that I got any good at Star Wars Battlefront was because of the Prima Official Game Guide. So I reckoned that the appropriate guide for Star Wars Battlefront II might be similarly useful. So I popped next door (from Pets at Home) to PC World. At the front of the queue I handed over the book to the woman at the till. She took it and scanned it. Woman: Is this for home use? Me: [Pausing to stop myself saying something sarcastic.] Yes. Home use. How do much I wish that I could have said, “No. 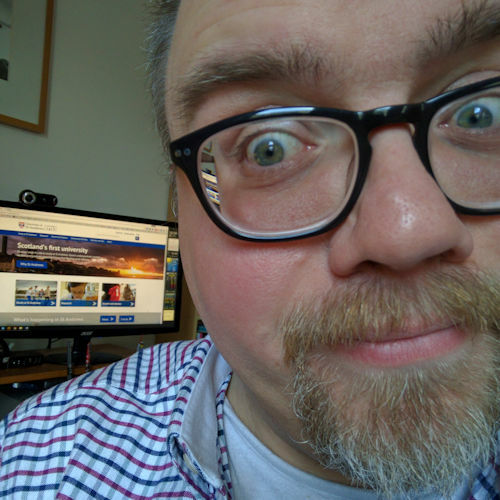 No, this is for the first Scottish Episcopal Church All-Clergy Star Wars Battlefront II Online Gaming Expo next month”! It could have been a taxable expense if there was such an event. Great news! Firefox 1.5 has been released today. Head over to www.getfirefox.com to download it (5.0 MB). Seemingly (according to my lovely, getting-geekier-every-day friend James Frost) Firefox 1.5 is exactly the same as Firefox 1.5 RC3, which means that they obviously didn’t find any other major bugs since Release Candidate (read: nearly finished version) 3– good skills! This is a major upgrade from the previous version (1.0.7.) and as well as including a number of security updates and bug fixes, it adds moveable tabs, improved pop-up blocking, and automatic updates of extensions and also for the browser itself. A word of warning, however. If you use a lot of extensions (installable add-ons that extend the capabilities of your browser) check whether these have been updated for Firefox 1.5 before you upgrade. In Firefox 1.0.7 I had fifteen extensions installed. So far I now have twelve, including the two that installed by default. Download Manager Tweak 0.7.1 – A modification of the Firefox download manager that changes its appearance and allows it to be opened in a separate window, a new tab, or the sidebar. ForecastFox 0.8.2.4 – Get international weather forecasts and display it in any toolbar or statusbar. Google Toolbar for Firefox – Adds a toolbar giving access to useful Google functions including the essential AutoFill options for quickly filling in online forms. IE View 1.2.7 – Launch pages in Internet Explorer from Firefox. Image Toolbar 0.6.1 – Provides easy access to common image functions. Image Zoom 0.2.1 – Adds zoom functionality for images. Tabbrowser Preferences 1.2.8.7 – Enhances control over some aspects of tabbed browsing. Tab X 0.9.2 – Adds a close tab button [x] to each of the browser tabs. Web Developer 0.9.4 – Adds a menu and a toolbar with various web developer tools. Updated extensions that I’ve not found so far include PrintPreview, AutoFill (which is more comprehensive than the Google Toolbar offerings) and PDF Download. However, it looks like a million people and their brothers are trying to update all their extensions too as Mozdev is running very slowly indeed. When I was a student at the Unversity of St Andrews I used to love November. November opens with All Saints’ Day (1 November) and closes with St Andrew’s Day (30 November) and as chance would have it there are two Scottish Episcopal Churches in St Andrews: All Saints and St Andrew’s. The fact that my birthday also fell in the middle of November had nothing to do with it! Not everything in black and white makes sense! A couple of days ago someone got all politically correct on me while I was talking about ‘coloureds’. Walking in on the end of my conversation he pulled me up for my vocabulary, “They’re not called ‘coloureds’ these days, they prefer to be known as ‘blacks’,” he said. So, apparently when I’m washing my clothes from now on (which is what I’d been talking about) I now have only two hues of clothing: whites and ‘blacks’! It was so much easier when I could refer to the latter pile of clothes as ‘coloureds’. Posted on Wednesday 30 November 2005 Monday 25 June 2018 Categories GeneralTags humour3 Comments on Not everything in black and white makes sense!